The Arabian Gulf University (AGU) has signed the first of the contracts for the construction of the King Abdullah bin Abdulaziz Medical City with the Saudi Fund for Development on Thursday. The signing ceremony was attended by the Bahrain Minister of Education HE Dr Majid bin Ali Al Nuaimi and the Ambassador of the Custodian of the Two Holy Mosques to the Kingdom of Bahrain, Dr Abdullah Abdul Malik Al Shaikh and a number of VIPs. During the signing ceremony, Dr Khalid Abdul Rahman Al Ohaly, President of AGU said that it is with God’s grace that the signing of the contract coincides with the festivities in the Gulf such as the third anniversary of the ascension of the Custodian of the Two Holy Mosques King Salman bin Abdulaziz Al Saud, Bahrain’s National Day, and the ascension His Majesty King Hamad bin Isa Al Khalifa. “This signing is the actual beginning and launch of construction work on the Medical City project, as the project contractor has begun the work of building the medical city on the site,” Dr Al Ohaly said. The University President prayed for mercy and reward for the late Custodian of the Two Holy Mosques King Salman bin Abdulaziz Al Saud, due to his royal generosity to build the Medical City with the sum of one billion Saudi riyals, affiliate to AGU, as a gift from Saudi people to the people of Bahrain for their service to the Gulf. He also extended gratitude to His Majesty King Hamad bin Isa Al Khalifa for his donation of a million square meters of land in a strategic location for the construction of the Medical City project. In his opening speech, he said that the Medical City was designed by expertise and competencies from various medical specialisations from all GCC countries. He added: “I extend my thanks and gratitude to the Custodian of the Two Holy Mosques King Salman bin Abdulaziz Al Saud for the support of the Government of the Kingdom of Saudi Arabia to the University and for financing the Medical City project through the Saudi Fund for Development. We also extend our gratitude and appreciation to His Majesty King Hamad Bin Al-Khalifa for his generous sponsorship of the University providing for all its needs, and granting land to build the Medical City project on”. He confirmed that the Medical City will be a distinctive addition to the residents of the Southern Governorate, as well as the residents of Bahrain and the Gulf community. The Medical City will include 300 beds and a full range of outpatient clinics, in addition to 15 operating rooms and quality support medical services such as advanced laboratories and a pharmacy. 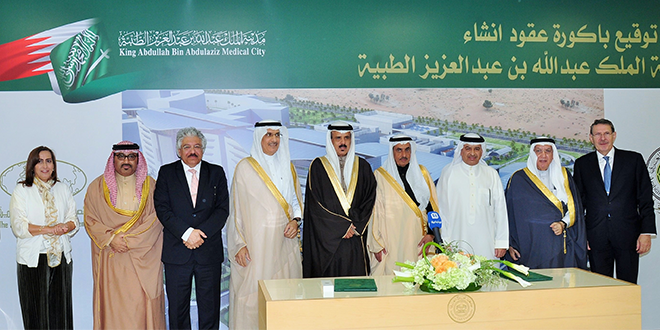 The three objectives of the Medical City are: the education and training of the students of the College of Medicine in the University who hail from GCC countries to benefit all health services in the Gulf, providing the faculty at the College of Medicine of AGU to practice their medical professions, and establishing centres for clinical research to address health issues prevalent in Arab Gulf States, such as diabetes, obesity, cancer and cardiovascular diseases. In conclusion, the President commended the efforts of His Excellency Shaikh Khalid bin Abdullah Al Khalifa, Deputy Prime Minister, in support of the Medical City project which is considered a strategic project. He also expressed his thanks and appreciation to His Excellency Minister of Education Dr Majid bin Ali Al Nuaimi and their Excellencies the Ministers of Education and Higher Education in GCC for their efforts and advice. At the end of the ceremony, a film was presented showing the designs of King Abdullah Medical City.